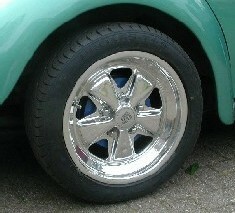 How do I polish my alloy (aluminium) wheels myself? 1) Remove the (powder paint) coating and anodising layer with a sanding tool (grit 60/80) on a drill or grinder. Wear proper protection of eyes and mouth / nose (a ‘gas mask’ is really necessary). In hard to reach places you can also use a Dremel or a wire brush whirligig. The latter produces less smooth results often requiring additional sanding! Make sure the surface is completely clean before you start to polish! 2) If there are still large pits or scratches, sand the surface smooth completely with flap wheels or sanding paper (grit <150). 3) Now the donkey work can start, sanding by hand. If you do not sand well enough, you will always see the negative effect of it. Use waterproof sanding paper with, successively, these grits: 240, 400, 600, 800, 1,000 and 1,200. If you can get hand of grit 2,000, use this at the end. You will see that the rim already starts to shine afterwards. 4) Now the real buffing / polishing can start. Often it is recommended to start with coarse buffing compound and then use fine buffing compound. However, we have no difference compared to using fine buffing paste right away. Buffing compound is available at the DIY stores and online. Use loose cotton or buffing wheels on a drill and felt wheels on the Dremel. We also tried felt wheels on the drill, but the result was not that good. If you still work with coarse and fine buffing compound, be sure to use different buffing wheels. The wheels get very dirty and dark. This is no problem, but you can clean them by letting them rub (rotate them counter clockwise) along a hacksaw. Be sure to tape the drill bit! If it touches the rim, you can start renewed with sanding and buffing! 5) The maintenance. We have been advised to use ‘Belgom’. You can buy this in specialist parts stores. Meanwhile, we have used it a few times for polishing, and it indeed gave a beautiful shiny result.